August 14, marks the end of World War II. This article by Dr. Jacques Pauwels was published seven years ago. If Donald Trump decides to wage a preemptive nuclear attack against North Korea, World War III would commence with a mushroom cloud. The threat is real: the US contemplates waging war war on North Korea. China and Russia have borders with North Korea. A nuclear war against North Korea would be a prelude to a third World War. How would World War III end. Would it have an ending? In the words of Fidel Castro, “the collateral damage” of a nuclear war in the present context would be humanity in its entirety. As the country that had made the biggest contribution and suffered by far the greatest losses in the conflict against the common Nazi enemy, the Soviet Union wanted major reparation payments from Germany and security against potential future aggression, in the form of the installation in Germany, Poland and other Eastern European countries of governments that would not be hostile to the Soviets, as had been the case before the war. Moscow also expected compensation for territorial losses suffered by the Soviet Union at the time of the Revolution and the Civil War, and finally, the Soviets expected that, with the terrible ordeal of the war behind them, they would be able to resume work on the project of constructing a socialist society. The American and British leaders knew these Soviet aims and had explicitly or implicitly recognized their legitimacy, for example at the conferences of the Big Three in Tehran and Yalta. That did not mean that Washington and London were enthusiastic about the fact that the Soviet Union was to reap these rewards for its war efforts; and there undoubtedly lurked a potential conflict with Washington’s own major objective, namely, the creation of an “open door” for US exports and investments in Western Europe, in defeated Germany, and also in Central and Eastern Europe, liberated by the Soviet Union. In any event, American political and industrial leaders – including Harry Truman, who succeeded Franklin D. Roosevelt as President in the spring of 1945 – had little understanding, and even less sympathy, for even the most basic expectations of the Soviets. These leaders abhorred the thought that the Soviet Union might receive considerable reparations from Germany, because such a bloodletting would eliminate Germany as a potentially extremely profitable market for US exports and investments. Instead, reparations would enable the Soviets to resume work, possibly successfully, on the project of a communist society, a “counter system” to the international capitalist system of which the USA had become the great champion. America’s political and economic elite was undoubtedly also keenly aware that German reparations to the Soviets implied that the German branch plants of US corporations such as Ford and GM, which had produced all sorts of weapons for the Nazis during the war (and made a lot of money in the process) would have to produce for the benefit of the Soviets instead of continuing to enrich US owners and shareholders. Negotiations among the Big Three would obviously never result in the withdrawal of the Red Army from Germany and Eastern Europe before the Soviet objectives of reparations and security would be at least partly achieved. 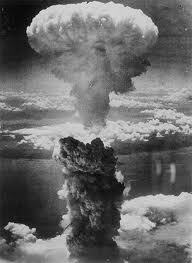 However, on April 25, 1945, Truman learned that the US would soon dispose of a powerful new weapon, the atom bomb. Possession of this weapon opened up all sorts of previously unthinkable but extremely favorable perspectives, and it is hardly surprising that the new president and his advisors fell under the spell of what the renowned American historian William Appleman Williams has called a “vision of omnipotence.” It certainly no longer appeared necessary to engage in difficult negotiations with the Soviets: thanks to the atom bomb, it would be possible to force Stalin, in spite of earlier agreements, to withdraw the Red Army from Germany and to deny him a say in the postwar affairs of that country, to install “pro-western” and even anti-Soviet regimes in Poland and elsewhere in Eastern Europe, and perhaps even to open up the Soviet Union itself to American investment capital as well as American political and economic influence, thus returning this communist heretic to the bosom of the universal capitalist church. In the meantime the Japanese battled on in the Far East, even though their situation was totally hopeless. They were in fact prepared to surrender, but they insisted on a condition, namely, that Emperor Hirohito would be guaranteed immunity. This contravened the American demand for an unconditional capitulation. In spite of this it should have been possible to end the war on the basis of the Japanese proposal. In fact, the German surrender at Reims three months earlier had not been entirely unconditional. (The Americans had agreed to a German condition, namely, that the armistice would only go into effect after a delay of 45 hours, a delay that would allow as many German army units as possible to slip away from the eastern front in order to surrender to the Americans or the British; many of these units would actually be kept ready – in uniform, armed, and under the command of their own officers – for possible use against the Red Army, as Churchill was to admit after the war.) In any event, Tokyo’s sole condition was far from essential. Indeed, later – after an unconditional surrender had been wrested from the Japanese – the Americans would never bother Hirohito, and it was thanks to Washington that he was to be able to remain emperor for many more decades. The Japanese believed that they could still afford the luxury of attaching a condition to their offer to surrender because the main force of their land army remained intact, in China, where it had spent most of the war. Tokyo thought that it could use this army to defend Japan itself and thus make the Americans pay a high price for their admittedly inevitable final victory, but this scheme would only work if the Soviet Union stayed out of the war in the Far East; a Soviet entry into the war, on the other hand, would inevitably pin down the Japanese forces on the Chinese mainland. Soviet neutrality, in other words, permitted Tokyo a small measure of hope; not hope for a victory, of course, but hope for American acceptance of their condition concerning the emperor. To a certain extent the war with Japan dragged on, then, because the Soviet Union was not yet involved in it. Already at the Conference of the Big Three in Tehran in 1943, Stalin had promised to declare war on Japan within three months after the capitulation of Germany, and he had reiterated this commitment as recently as July 17, 1945, in Potsdam. Consequently, Washington counted on a Soviet attack on Japan by the middle of August and thus knew only too well that the situation of the Japanese was hopeless. (“Fini Japs when that comes about,” Truman confided to his diary, referring to the expected Soviet entry into the war in the Far East.) In addition, the American navy assured Washington that it was able to prevent the Japanese from transferring their army from China in order to defend the homeland against an American invasion. Since the US navy was undoubtedly able to force Japan to its knees by means of a blockade, an invasion was not even necessary. Deprived of imported necessities such as food and fuel, Japan could be expected to beg to capitulate unconditionally sooner or later. As far as the American leaders were concerned, a Soviet intervention in the war in the Far East threatened to achieve for the Soviets the same advantage which the Yankees’ relatively late intervention in the war in Europe had produced for the United States, namely, a place at the round table of the victors who would force their will on the defeated enemy, carve occupation zones out of his territory, change borders, determine postwar social-economic and political structures, and thereby derive for themselves enormous benefits and prestige. Washington absolutely did not want the Soviet Union to enjoy this kind of input. The Americans were on the brink of victory over Japan, their great rival in that part of the world. They did not relish the idea of being saddled with a new potential rival, one whose detested communist ideology might become dangerously influential in many Asian countries. By dropping the atomic bomb, the Americans hoped to finish Japan off instantly and go to work in the Far East as cavalier seul, that is, without their victory party being spoiled by unwanted Soviet gate-crashers. Use of the atom bomb offered Washington a second important advantage. Truman’s experience in Potsdam had persuaded him that only an actual demonstration of this new weapon would make Stalin sufficiently pliable. Nuking a “Jap” city, preferably a “virgin” city, where the damage would be especially impressive, thus loomed useful as a means to intimidate the Soviets and induce them to make concessions with respect to Germany, Poland, and the rest of Central and Eastern Europe. The atomic bomb was ready just before the Soviets became involved in the Far East. Even so, the nuclear pulverization of Hiroshima on August 6, 1945, came too late to prevent the Soviets from entering the war against Japan. Tokyo did not throw in the towel immediately, as the Americans had hoped, and on August 8, 1945 – exactly three months after the German capitulation in Berlin – the Soviets declared war on Japan. The next day, on August 9, the Red Army attacked the Japanese troops stationed in northern China. Washington itself had long asked for Soviet intervention, but when that intervention finally came, Truman and his advisors were far from ecstatic about the fact that Stalin had kept his word. If Japan’s rulers did not respond immediately to the bombing of Hiroshima with an unconditional capitulation, it may have been because they could not ascertain immediately that only one plane and one bomb had done so much damage. (Many conventional bombing raids had produced equally catastrophic results; an attack by thousands of bombers on the Japanese capital on March 9-10, 1945, for example, had actually caused more casualties than the bombing of Hiroshima.) In any event, it took some time before an unconditional capitulation was forthcoming, and on account of this delay the USSR did get involved in the war against Japan after all. This made Washington extremely impatient: the day after the Soviet declaration of war, on August 9, 1945, a second bomb was dropped, this time on the city of Nagasaki. A former American army chaplain later stated: “I am of the opinion that this was one of the reasons why a second bomb was dropped: because there was a rush. They wanted to get the Japanese to capitulate before the Russians showed up.” (The chaplain may or may not have been aware that among the 75,000 human beings who were “instantaneously incinerated, carbonized and evaporated” in Nagasaki were many Japanese Catholics as well an unknown number of inmates of a camp for allied POWs, whose presence had been reported to the air command, to no avail.) It took another five days, that is, until August 14, before the Japanese could bring themselves to capitulate. In the meantime the Red Army was able to make considerable progress, to the great chagrin of Truman and his advisors. And so the Americans were stuck with a Soviet partner in the Far East after all. Or were they? Truman made sure that they were not, ignoring the precedents set earlier with respect to cooperation among the Big Three in Europe. Already on August 15, 1945, Washington rejected Stalin’s request for a Soviet occupation zone in the defeated land of the rising sun. And when on September 2, 1945, General MacArthur officially accepted the Japanese surrender on the American battleship Missouri in the Bay of Tokyo, representatives of the Soviet Union – and of other allies in the Far East, such as Great Britain, France, Australia, and the Netherlands – were allowed to be present only as insignificant extras, as spectators. Unlike Germany, Japan was not carved up into occupation zones. America’s defeated rival was to be occupied by the Americans only, and as American “viceroy” in Tokyo, General MacArthur would ensure that, regardless of contributions made to the common victory, no other power had a say in the affairs of postwar Japan. With the passing of time, many historians have concluded that the bomb was used as much for political reasons…Vannevar Bush [the head of the American center for scientific research] stated that the bomb “was also delivered on time, so that there was no necessity for any concessions to Russia at the end of the war”. Secretary of State James F. Byrnes [Truman’s Secretary of State] never denied a statement attributed to him that the bomb had been used to demonstrate American power to the Soviet Union in order to make it more manageable in Europe. Truman himself, however, hypocritically declared at the time that the purpose of the two nuclear bombardments had been “to bring the boys home,” that is, to quickly finish the war without any further major loss of life on the American side. This explanation was uncritically broadcast in the American media and it developed into a myth eagerly propagated by the majority of historians and media in the USA and throughout the “Western” world. That myth, which, incidentally, also serves to justify potential future nuclear strikes on targets such as Iran and North Korea, is still very much alive – just check your mainstream newspaper on August 6 and 9! Jacques R. Pauwels, The Myth of the Good War: America in the Second World War, Toronto, 2002, pp. 201-05. William Appleman Williams, The Tragedy of American Diplomacy, revised edition, New York, 1962, p. 250. Quoted in Michael Parenti, The Anti-Communist Impulse, New York, 1969, p. 126. Gar Alperovitz Atomic Diplomacy: Hiroshima and Potsdam. The Use of the Atomic Bomb and the American Confrontation with Soviet Power, new edition, Harmondsworth, Middlesex, 1985 (original edition 1965), p. 223. Pauwels, op. cit., p. 143. Alperovitz, op. cit., pp. 28, 156. Quoted in Alperovitz, op. cit., p. 24. Cited in David Horowitz, From Yalta to Vietnam: American Foreign Policy in the Cold War, Harmondsworth, Middlesex, England, 1967, p. 53. Studs Terkel, “The Good War”: An Oral History of World War Two, New York, 1984, p. 535. Gary G. Kohls, “Whitewashing Hiroshima: The Uncritical Glorification of American Militarism,” http://www.lewrockwell.com/orig5/kohls1.html. Sean Dennis Cashman, , Roosevelt, and World War II, New York and London, 1989, p. 369.